Schaublin 102N-CF with variable frequency drive. 2005 vintage. I created this page in order to share information with other owners of these high precision Swiss lathes, or those that are interested in them. The Swiss made Schaublin lathes are highly sought after by watchmakers and precision instrument makers. I became interested in the Schaublin lathes because they meet my exacting requirements for accuracy, and their size is right for my needs. You can subscribe to the Schaublin Lathes discussion group by entering your e-mail address below and clicking on the button. Your e-mail address will be known ONLY to yahoo groups, and will not be stored by CinemaTechnic. Schaublin of Switzerland began manufacturing machine tools in 1915. They manufactured a range of lathes and milling machines ranging in size from small watch and instrument maker’s lathes to large tool room lathes and milling machines. Schaublin is highly regarded throughout the machine tool industry for building some of the most finely made and accurate machines in the industry. In fact, the Iraqi regime of Saddam Hussein was caught trying to purchase Schaublin machines for their nuclear weapons program in 1990. Fortunately the shipment was intercepted by the German government when their true destination was revealed. Schaublin Machines SA is located in Bevilard, Switzerland. Schaublin Delemont, the now separate manufacturer of collets and work holding equipment, is located in Delemont, Switzerland. Perhaps the most well known Schaublin machines are the model 70 and 102 plain turning lathes. These small super precision lathes have a very strong following among watch and precision instrument makers. These machines have become Schaublin’s most successful product, and over 100,000 been produced. A large knob loosens the nut on a bolt that holds the carriage in position on the length of the bed. The carriage can then be moved along the length of the bed and the knob tightened. This serves as the coarse longitudinal adjustment. Fine adjustment is performed with leascrews. The longitudinal axis has a movement of 90mm for the standard 102 carriage and 150mm for the optional long carriage. The upper slide is used for the longitudinal axis and the lower slide for the infeed (diametral) axis. The upper slide also pivots 360º for angled cuts, with indexing marks every degree. The carriage is part of the reason behind the Schaublin plain lathes’ accuracy. The simple design and short movements make it easier to design an assembly with very tight tolerances. The simpler design is also easier to maintain and therefore keep accurate. • tool-room lathe (TO 70, TO 102), with Screw Operated Carriage and standard screw operated tailstock with 2º taper or Morse taper. • turret lathe (TR 70, TR 102) with a multiple tool turret in place of the tailstock. The Schaublin plain lathes are offered as bench mounted machines, meant to be installed on a heavy solid hardwood table top with a motor mounted behind the headstock. The 70 and 102 were also offered with a very sturdy and heavy cast iron base. The base also houses the motor. The mass of the base helps damp vibrations and improve the accuracy and finish the machines can deliver. The 70 lathe with drawback collets use the W12 collet. Maximum collet capacity is 12mm. Some 70 lathes use dead length F14 collets. The 102 lathe was offered with either a W20 or W25 collet. The “W” is the drawback type of collet, and the number refers to the diameter of the collet shank in millimeters. The draw-back “W” collets and are the most suitable for tool room work. The W20 collet is the most common size. The advantage of W20 is that it is a common collet size in Europe and it is easier to find used tooling. Maximum capacity for standard W20 collets is 20mm or 3/4 inch. The W25 collet is comparable in size to the American R8 collet, and R8 collet racks can be used to store them. Maximum capacity is 25mm or 1.0 inch. The advantage of W25 is capacity. Maximum capacity is only 1/16th inch less than the well-known 5C collet. TL and TR type lathes were frequently fitted with “F” type push collets which are not suitable for tool room work. A very large selection of accessories is available for the Schaublin 70, and the 102 lathe. A vertical milling slide can be attached to the carriage to mount a milling head. A grinding attachment are also available. These do not have an integrated motors like the more common “tool post grinder”, instead being driven by small diameter round belts from an overhead drive. The latest milling and grinding attachments for the 102N-Mi-CF have integrated motors. Special carriages for grinding and for spherical turning were offered. Two different types of thread cutting attachments were offered. One type uses a “driveshaft” to turn the leadscrew on the longitudinal feed. The second version uses leadscrews mounted behind the headstock. Both versions use a gearbox mounted to the back of the headstock for change gears. The latter version is still available as an accessory. Schaublin also offered “screw cutting” lathes based on the “engine lathe” pattern. A version of the 120 with a large leadscrew running under the bed and a carriage that can run 400mm along the length of the bed. The 102VM has a bed design that is similar to the 102, but has two triangular extensions on the sides to guide the VM carriage. The 102 can therefore use tailstocks and steady rests designed for the plain 102. The 102VM is always mounted on a cast iron base. In the late 1970’s the 102 lathe was redesigned and designated the 102N. These newer models have a heavier “squared” construction of the bed, headstock and tailstock. The cast iron base was also updated. The carriage is nearly identical. The model 70 was not significantly changed, which is why there is no 70 N.
The next generation, termed 102N-CF, features a frequency inverter drive for variable speed capability. These are available as both bench mount and cast iron base machines. The latest 102N-Mi-CF features a completely new headstock that has the motor completely contained in the headstock. This model is only offered as a bench mount since the base is not needed for supporting the motor and electronics. Larger Schaublin “engine lathe style” toolroom lathes were the 120, 125, 135, 150 and 160. These models are rare compared to the plain lathes and were very costly when new. They are extremely complex and offer most of the conveniences expected of larger tool room lathes such as power feeds. 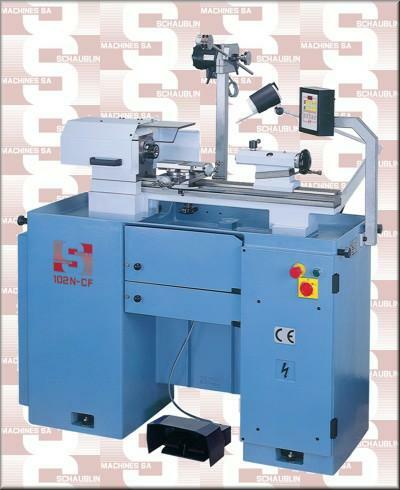 The current Schaublin line also includes various CNC machines. Back in 2000, when I got started, with zero prior experience, I had been able to make small parts with tight tolerances, with care, on my Sherline 4400 miniature lathe. The Sherline is a great way to start for someone with no metalworking experience. It can do good work on small parts, but it is not designed to work on larger pieces (3 inch [75mm] diameter and up), or tough materials like Stainless Steel. The largest chuck available for the sherline is 3.1 inches. It is a commonly accepted rule of thumb that the “swing” of a lathe should be three times the largest diameter workpiece you want to cut for aluminum, brass and free machining steel, and four times that diameter for hard or tough steels. Since I wanted to produce stainless steel parts of about 3 inch diameter, I would need a lathe with a swing of about 9 inches. I also felt I needed an approximately 1 horsepower motor. The lathe needed to have a robust construction of cast iron and steel, in order to have the rigidity I needed to work on larger parts and tougher materials. At the time, my limitation was that it had to fit on a 36 x 60 inch workbench, and it had to be no heavier than 300 lbs (136 Kg). This limitation was created by my existing workspace, which is a 10 x 12 foot room in a 1000 square foot apartment. Not the ideal workspace, but it allowed me to put my money into the business and grow. In late 2002 I got my first Swiss lathe, a Habegger JH 102 which is a near clone of the Schaublin 102. You can read about the JH 102 on my Habegger page. If you are a model engineer or other hobbyist and you think you cannot have a large lathe for space reasons, a Habegger or Schaublin 102 bench mount is one of the best choices you can make. I also needed the machine to be built to do high precision work. I had little confidence that I would be able to hold the tight tolerances I needed on one of the inexpensive asian imported lathes that are commonly available in the size I need. Everyone that has used one tells me they are “rough”. Outside of those machines, there were no other precision bench lathes available in my size range except for the German Prazi/ Wabeco lathes. My work sometimes requires tolerances of 0.0004 inch, (4/10,000ths), or 0.01mm (1/100th). It is commonly accepted in the manufacturing industry that the no-load positioning accuracy of a lathe or mill needs to be less than 1/3 of the expected tolerance in the finished part. This means that in order to produce parts to a tolerance of .0005 in, I would need a lathe that had a positioning accuracy of less than .0002 in, and preferably 0.003mm or less. The Schaublin 102 works out perfectly for my needs. It has a 102mm center height, so the swing is 8.03 in [204mm]. The distance between centers is just under 18 in [450mm]. The lathe came equipped with a 0.8 HP 220V 3-phase AC motor. The Schaublin 102 has a modular construction. The headstock, tailstock and cross slide come off easily. When the SV 102 lathe is disassembled, there is no component of it that is more than a 2-man lift. The largest and heaviest part, the lathe bed, weighs approximately 120 lbs. Drive System: 1.5 Kw motor (see specs below), driving through clutch and brake (foot pedal operated), through dual V-belt pulleys with two ratios available, to countershaft (foot pedal operated) with a 3 step pulley driving an identical pulley on the lathe spindle driven by a flat belt (Habasit). Compound Slide: “carriage”, two types, 102-45.000 (90mm stroke) 12 kg, 102-45.150 (150mm stroke) 12.8 kg. A lever operated version 102-47.000 is also available. Length of the bed: 1 meter [39.37 in]. flat ways, ground cast iron. Undersides of the headstock and tailstock that mate with the bed are hand scraped. Toolpost: Tripan 111 or Multifix size A quick-change toolpost. Both are Swiss made and designed for 10mm square tool bits. 3/8 in tool bits work fine. Schaublin 102-VM, 120, 135 or 150 Leadscrew lathes. Please e-mail with description, location, condition and photo if posssible. J. Habegger TLDE 500 or TLDG Lathe. This is the screwcuting version of the JH 102, with a leadscrew and carrige feed. Swiss Multiquick (know in Europe as Multifx) Tool Holder, size Aa, A or E (Sold by Schaublin or SPI). This type of toolholder has a curved, serrated interface between the tool post and holders. Geared screw cutting attachment for Habegger or Schaublin 102. Found one! W-25 Tooling: Collets, Centers, Arbors, Shanks, etc. Faceplates with W25 Spindle Nose (37.75 x 3.0mm Schaublin spindle thread). Any Habegger or Schaublin tooling. Please e-mail description and send a jpeg photo if possible. Schaublin lathe page on anglo-swiss-tools.co.uk (Dr. David Samways) Also supplier of used Aciera, Schaublin, Mikron and other fine Swiss lathes and mills, plus accessories. Schaublin lathe page on lathes.co.uk (Tony Griffiths). Also supplier for information and manuals for various lathes, and suppier of the Fenner Nu-T-Link belt.